(Doha, Qatar)–There was something special in the air throughout the day today at the Al Sadd Sports Club in Doha, and it wasn’t the crisp cool air conditioning offering comfort to fans and players alike. It was an intangible, what we used to call on the east coast of the USA, “that certain something,” an unknowable, hard to describe feeling, when you know something is good, but you can’t quite figure out why. You just know it’s good, and it’s only going to get better. You just know it. Perhaps it was the sheer volume of high quality and tight matches that took place, the incredible talent on display that is as good as has ever been seen in pool, all combined with the fact that on Day 3 of the 2012 World 9-balll Championship, the gravity of the moment, of the stakes involved, started to dawn on players and fans alike. This part of the tournament is all about getting through to the next round. 32 players did just that today as they cashed in their chips to the next stage, the single elimination knockout round of 64 which will begin on Wednesday June 27. Some had it easy, others not so much. But all who made it breathed a massive sigh of relief. Just get through, wipe the slate clean, and start fresh on Wednesday. 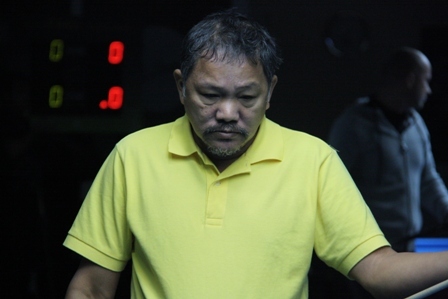 With 17 Filipinos in the field of 128 players, including the legendary Efren Reyes, and Francisco Bustamante, the venue is never short of large and vocal crowds of Filipino overseas workers and this certainly spices up the already pressure filled atmosphere. They came out in force today as the winners of each group faced off for a quick chance out of the danger zone of the group stage and into the final 64, including Reyes who played in the first session. Reyes did his part as he easily defeated Kuwait’s Badr Al Awadi 9-2 to advance to the next round. Afterward Reyes offered his patented line for why he won. Several players clearly stepped up their game early on. Malta’s popular Tony Drago sprinted past the Philippines Ramil Gallego, 9-6. Afterward, pool’s version of Speed Racer said he’s primed and ready to wreak havoc in the coming days and welcomes the pressure that is sure to come. 2003 World 9-ball Champion Thorsten Hohmann put in a solid performance, as did France’s Vincent Faquet, who fought back from 4-2 down to beat the Philippines very tough Jundel Mazon, 9 – 5. Scotland’s Jason Shaw, a former English 8-ball World Champion, smothered China’s Fu Jian Bo, 9-5. A great story has developed out of New Zealand as 24 year old Matthew Edwards continued his fine run in this year’s tournament, advancing to the knockout stage with an impressive 9-5 win over Malaj Nikolaos of Albania. Edwards, who’s playing in his first world championship, first took down the USA’s Shane Van Boening. He now becomes the first ever Kiwi to make it this far in a world championship. As the day wore on the matches just got better, tighter and more pressure packed. World 8-ball Champion Chang Jung Lin came back from 8-6 down to Naouki Ohi of Japan, and won 9-8. 2007 World 9-ball Champion Daryl Peach of England was 5-0 down to Croatian Bozo Primic but clawed back to win a thriller, 9-8. Taiwan’s Chang Yu Lung and Austria’s Albin Ouschan, the brother of women’s star Jasmine Ouschan, went all the way with Chang prevailing 9-8. The USA’s Hunter Lombardo had the Philippines Ronnie Alcano on the ropes, but lost a cliff hanger 9-8. One of the more entertaining matches happened between Greece’s Nick Ekonomopoulos and China’s Liu Haitao, two very solid rising talents. Ekonomopoulos was down 7-2 but ended up winning 9-8. The confident Greek, who’s playing in his first world championship, looks to be an interesting dark horse in this event. He recently won the Austrian Open on the Euro Tour. He was so confident in his abilities that he flew to Qatar without an entry into the tournament and entered the brutally tough qualifiers, where he won one event and made it into the main draw. With the pressure way too intense late his match with Liu, he looked positively deadly. Also advancing today were Hall of Famer Ralf Souquet of Germany, the Netherland’s Nick Van den Berg, England’s Karl Boyes, Filipinos Francisco Bustamante, Lee Van Corteza, Carlo Biado and Antonio Gabica, Taiwan’s Fu Che Wei, and Russian Konstantin Stepanov, who beat defending champion Yukio Akagariyama. The surprise of the evening was Dennis Orcullo going down to Hong Kong’s Andrew Kong, 9-5. Kong advances while Orcullo has to come back Tuesday for one last try. That’ll happen on Tuesday, Judgement Day, when all matches will be do-or-die. As the action heats up inside the Al Sadd Sports Club, the nerves will surely start to fray, easy pots will become testers, and dreams will be made and shattered on the smallest turn of the balls. 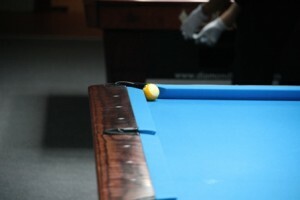 The WPA will be providing full up to the minute coverage of the 2012 World 9-ball Championship via its website atwww.wpapool.com. There you can follow the action through our live scoring platform, articles with insights and analysis, and updated brackets. Fans can also get updates via the WPA Twitter page, @poolwpa.com. 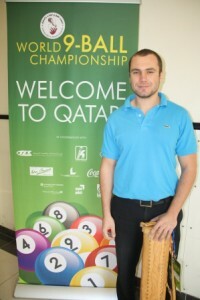 Fans can also access live scoring through the official website of the Qatar Billiards and Snooker Federation at: http://www.qbsf.net/en/live_score.php. *The World Pool And Billiard Association(WPA) is the international governing of the sport of pocket billiards.